We live in strange times—along with a quickly growing industry of mindfulness apps designed to help us do less, we’re using all sorts of productivity apps designed to help us do more. 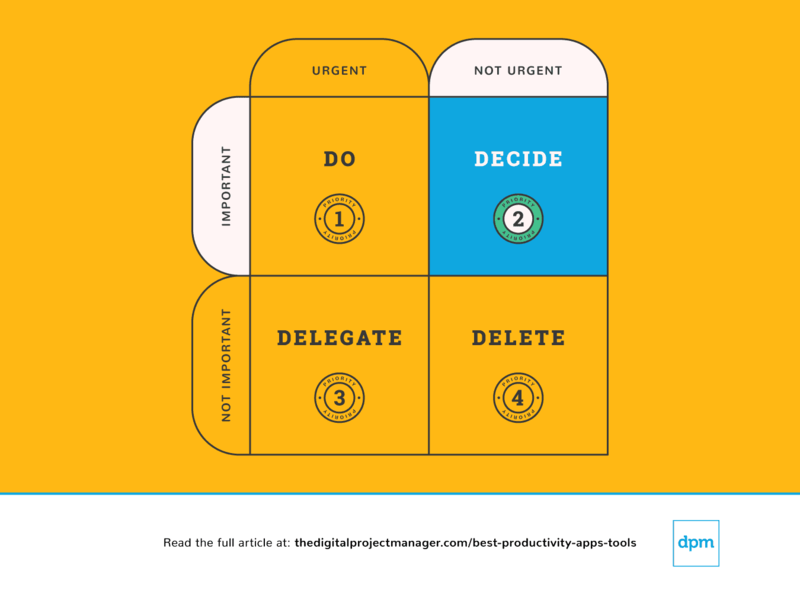 If you’re in digital work, you’ve probably tried out some form of productivity software. What is productivity software? Productivity tools cover a range from simple to-do lists to productivity tracker tools that measure how much you get done on a given day. When thinking about apps that’ll work well for you, remember that the best organization apps or best reminder apps are only the “best” if they help you, in your specific case, to do the right work in a way that consistently works well for you. In short, the best productivity apps are tools that help you effectively get sh*t done. Too often, we focus on productivity as a question of volume: how much am I making, and how quickly? To truly do impactful work, we have to reposition our thoughts on productivity: it’s actually about making better use of your time. How do you make better use of your time? What can I (and only I) do that, if done well, will make a real difference? Priority #1: It’s urgent and important. Do it. Priority #2: It’s not urgent but still important. Decide on any points that are blocking the task from moving forward. Decide on the ideal time, person, and method to carry out the task. Priority #3: It’s urgent but not important. 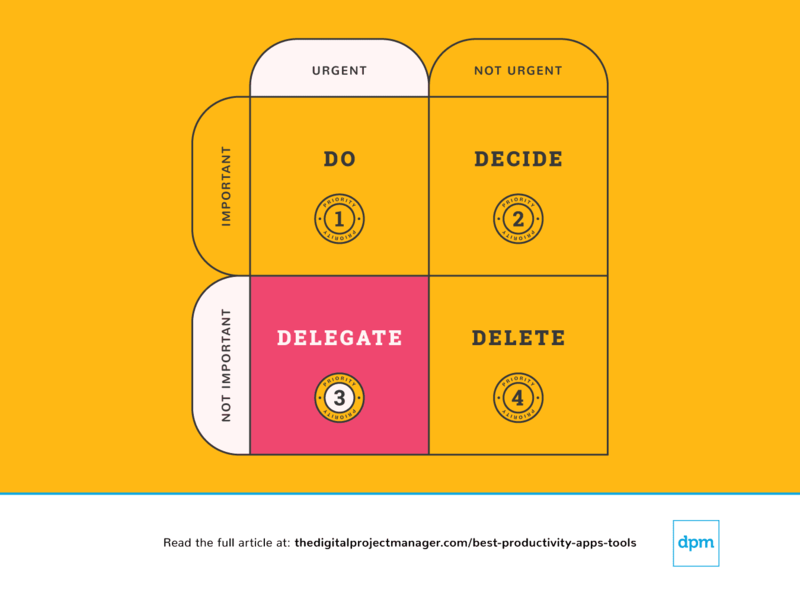 Delegate it to the appropriate person so you can focus on important tasks. Priority #4: It’s not urgent and also not important, it’s 4th priority. Delete it. At the end of each day, spend 10 minutes planning out what your day will look like tomorrow—what will you do, decide, delegate, and delete? Then, have a look at these productivity apps. I’ve chosen ones that can help you carry out the important work of being effective with your time by automating, tracking, syncing, and reminding—leaving you with more time to do the work that matters most! The following productivity apps can help you complete a wide range of tasks. As you browse, look for productivity software that automates tasks or records important data so you can offload these mental burdens and free up time for effective, impactful work. Priority #2: It’s Not Urgent But Still Important. Decide on it. Priority #3: It’s Urgent But Not Important. Delegate It. Priority #4: It’s Not Urgent And Also Not Important. Delete it! Your top tasks need the “do it now” rule. Along the same lines, if you see a task that’ll take less than 2 minutes to do, just get it done right away (Why? Because it’ll take more time to put it on your to-do list and then schedule and prioritize it). Starting a high-priority task and persisting with that task until it is 100% complete is the true test of your character. It’s not easy, but it’s how you’re going to be productive. This takes self-discipline, but we can make it easier on ourselves with a few productivity tools. Taskful has been rated as one of the best productivity apps for Android and ranks high among Mac productivity apps for simple, intuitive design. Unlike some apps, Taskful offers a to-do list feature that’s more representative of real life, with tasks that are completed with a series of checkmarks as opposed to a choice between just “not done” and “done”. It’s a simple, straightforward tool—if you’re looking for a well-designed version of your traditional to-do list that’s not bogged down with extra features, this is a top choice. Taskful integrations are minimal for now, integrating only with the Health app to sync with workout data. Taskful costs from $4.99/month and is available for Android and iOS. The productivity app “Things” from Cultured Code has undergone several iterations, evolving into one of the best organization apps out there, with a beautiful aesthetic that simply feels good to use. Things 3 isn’t a productivity tracker, per se, because it doesn’t really attempt to measure or analyze your ability to cross things off your to-do list. Instead, this is a dynamic to-do list app with intuitive drag-and-drop organization and a refreshingly simple interface that allows you to create and organize your task lists in whatever way makes the most sense to you. Things is fully integrated with all the latest macOS technologies: Touch Bar, Today Widget, Calendars, Siri & Reminders, Share Extension, Handoff, and AppleScript. If you need more integrations, use Zapier to connect with 1000s of other apps, including Trello, Gmail, Slack, Evernote, Asana, Jira, and the list goes on. Things 3 is available for macOS 10+ and iOS 10+ and it costs $9.99 for iPhone and watch, $19.99 for iPad, and $49.99 for Mac. When your to-do list depends on close collaboration with others, Quip is one of the better team-focused apps for productivity on the market. From Salesforce, Quip is a collaboration platform that combines documents, spreadsheets, chat, and slides (and it also integrates with Salesforce, of course). One of the stronger points of this tool is its suite of Live Apps that you can use to add functionality to the tool—Kanban boards, countdowns, polls, calendar, etc—and waste less time toggling between different tools. Quip integrations include Jira, Dropbox, Github, Twitter, Slack, Salesforce, etc. For more integrations, Zapier allows you to integrate 1000+ other apps, such as Trello, Todoist, Airtable, Drive, and many more. Quip costs from $30/month for 5 users, and is available for Android and iOS. Does your productivity break down when you have trouble staying on track in the middle of the tasks you’ve set out to accomplish? Focus Booster is one of the productivity apps aimed at improving your work habits by minimizing distractions and maintaining a focus on the tasks at hand. Focus Booster is based off of the pomodoro technique, which is basically a method that uses time-boxing to complete tasks. This isn’t your humdrum checklist app: for people who want to understand how they work best, Focus Booster delivers a suite of useful tools for setting up your work day, tracking your hours, and analyzing your time, interruptions, and more. Focus booster integrations include Trello, Wunderlist, Asana, Basecamp, Todoist, Any.do, Omnifocus, Outlook, and Google Keep. Focus booster costs from $2.99/month, but there is also a free starter pack available. The app is available for Web, Windows, macOS, Linux, iOS, Android. Remember The Milk is a to-do and reminder app that helps you organize your tasks according to priority, due date, repetition, and more. This is a pretty simple and straightforward productivity app that lets you create tasks, break them down into subtasks, and organize them according to multiple tags and task types. A great thing about Remember the milk is that it lets you set up reminders for tasks, sending reminders via text, email, calendars, or other apps. Another great feature is the “Smart Lists” that help you sort and search for tasks according to criteria like “high priority and due this week” or “has already been postponed 2 times”, a practical solution for managing competing priorities. Remember the milk integrations include Gmail, Google Calendar, Email, IFTTT, Alexa, Siri, Evernote, Twitter, and Feeds. Remember the milk costs $39.99/year and is available on almost all platforms you might need: Web, MacOS, iOS, Android, Windows, Linux. You can use it on Apple Watch, iPhone, iPad, Android phones & tablets, BlackBerry 10, and Fire. If something is important but not necessarily urgent, you need to take a moment to decide on a proper plan for dealing with it. Stop getting sidetracked—plan to do the important stuff properly. We can find ourselves feeling totally overwhelmed because we’re being pulled in too many directions – it feels like there’s too much on our plate and no way to keep everyone happy. In order to make decisions that make the most sense for us, our team, and our projects, we need to have a clear view of all of our tasks, priorities, and progress. The following productivity apps are especially helping prioritize tasks—for checking what’s in the pipeline, tracking progress, and providing all the information to make solid decisions as we manage our work. Wunderlist is designed as both a professional and personal to-do list app. Use this productivity app to create tasks, set reminders, and collaborate with others by sharing tasks and lists. It’s very similar to Todoist. With its web browser extension, you can add anything from the web directly into your Wunderlist tasks, making it easy to grab important ideas on the go and make decisions on them later. You can also turn emails into tasks with a click by forwarding them to the Wunderlist app. Wunderlist integrations include Dropbox, Google Calendar, Outlook Calendar, Apple’s Calendar, Slack, and Sunrise Calendar. As of April, 2018 Wunderlist is free to use. It is available for iOS, Android, Fire OS, Microsoft Windows, Windows Phone, macOS, Chrome OS, watch OS. Todoist is similar to Wunderlist , providing a simple interface for creating, sharing, and prioritizing tasks. You can collaborate by sharing out your lists and assigning tasks to others, and you can use labels and priority tags to bring organization to your task lists. They have also rolled out a smart rescheduling feature that suggests an optimal time to schedule tasks that need to be pushed out to a future date based upon past behavior and what you’ve already got on your plate. Todoist integrations include Google Drive, Google Maps, Dropbox, Apple Maps, Calendar Sync, Slack, Zapier, and hundreds more apps. Todoist offers a free basic plan, but if you need more options you can upgrade for $29/user/year. It is available for MacOS, Android, Windows, iOS. Trello is a Kanban board app that can be used to organize tasks visually. It’s user-friendly, with an intuitive drag-and-drop interface that makes it easy to learn. This popular tool can be used to help you visualize your deadlines, items in progress, and completed tasks, enabling you to make informed decisions about what to work on next according to the big picture. It integrates with dozens of other apps, making it a great addition to an established toolkit of communication, file sharing, and productivity apps. Trello integrations include Slack, Google Drive, Jira, and dozens of other apps for development, productivity, project management, marketing, design, analytics, finance, file management, etc. Trello offers a freemium account and costs from $9.99 for a business account. It’s available on all operating systems. Asana is another popular Kanban-style task management tool that helps you visually organize and prioritize your work. Use this tool to set priorities, deadlines, tasks, and assignees, and to easily visualize and adjust the flow of your work. This is one of the most popular and widely used productivity apps along with Trello , and with a sleek, clutter-free design and robust suite of integrations, this is a productivity tool that you can use and adapt to a wide range of work and personal projects over time. Asana integrations include Zapier, Dossier, Timecamp, Microsoft Office 365, CSV Importer, and many more. Asana costs from $9.99/user/month and is available on all operating systems. Omni Focus markets itself as the “gold standard” to-do app, and it does deliver a great suite of features for planning, prioritizing, and sorting tasks. 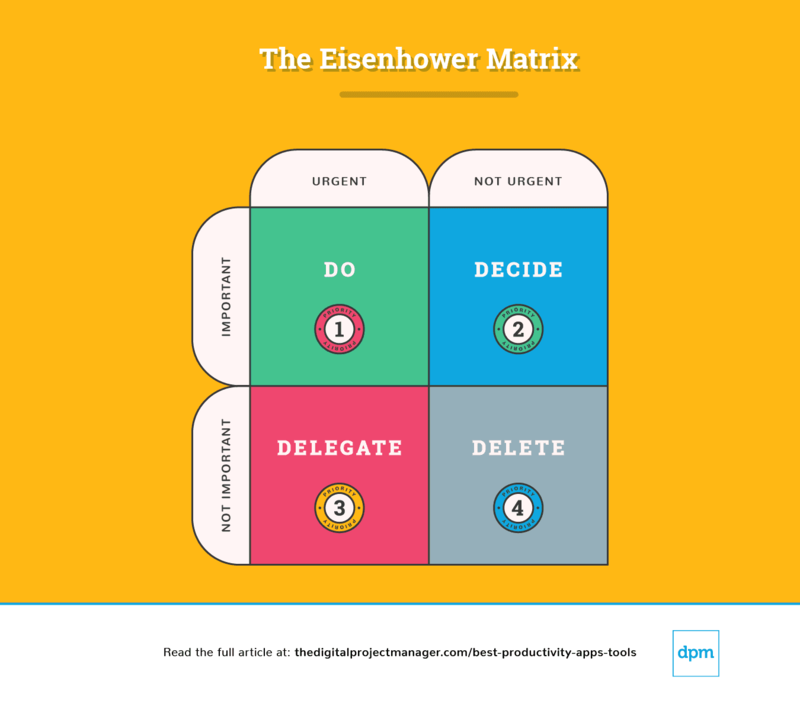 This productivity app offers a number of ways to categorize tasks (tags for location, people involved, energy level required, priority), which allows you to sort through tasks in a way that actually makes sense in practice and corresponds to the reality of managing your busy life. The biggest downside to this app is that it’s only available on Mac and iOS, so it’s best for users to plan to remain entirely in the Apple ecosystem. Omni Focus integrations include Airmail, Dispatch, Drafts, Fantastical 2, IFTTT, Launch Center Pro, Mailplane, and many more. Omni Focus is available for Mac and for iOS, and it is sold separately for both operating systems. The pricing starts from $39.99 for the standard version. Some people have an easy time delegating tasks, while others feel a really strong impulse to just “do it myself”. However hard it may be to offload tasks to other people, it’s really pretty simple to hand off tasks to a machine. There’s tons of productivity apps that we can use to do more with less time by adding more automation to our workflows, letting an algorithm handle the busy work. IFTTT (which stands for “if this, then that”) is the free way to get all your apps and devices in sync. 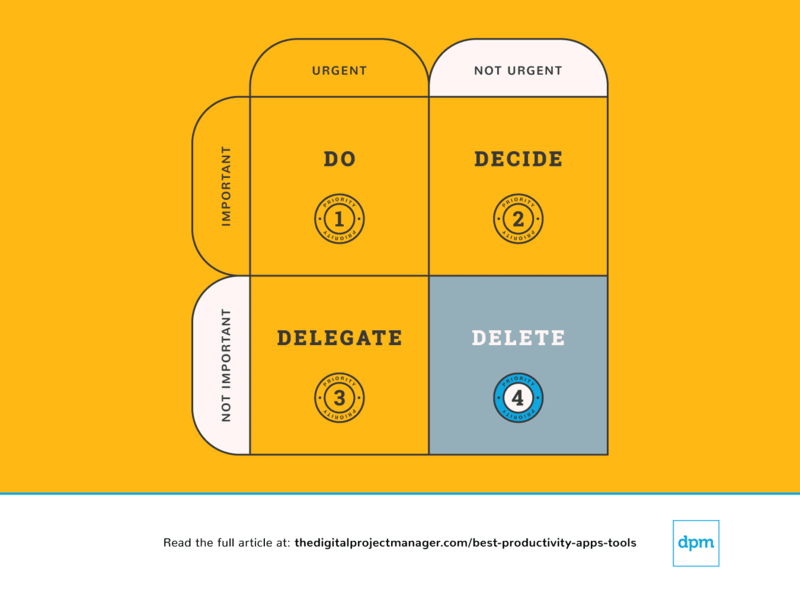 If any of these productivity apps can make a major difference in your “digital life”, IFTTT is it. The sky is really the limit on this one—IFTTT is free to use and lets you save time and brain cycles by letting you set up automations between your various apps. For example, you set it up so that photos you post on Instagram are automatically saved to Dropbox, or so your workout data is automatically entered in a Google spreadsheet. Using IFTTT, there are endless possibilities to offload and automate tasks of all kinds. IFTTT integrations include everything. This app is designed to sync apps and devices, so you’ll be hard-pressed to find a tool that it doesn’t integrate with. IFTTT is available on Android and iOS. Zapier moves info between your web apps automatically, similarly to IFTTT , so you can focus on your most important work. You can use this to create automated workflows from any app—for example, you can set it up to automatically save attachments from incoming emails in a Dropbox folder and then create an alert in Slack reminding you to check out the file. 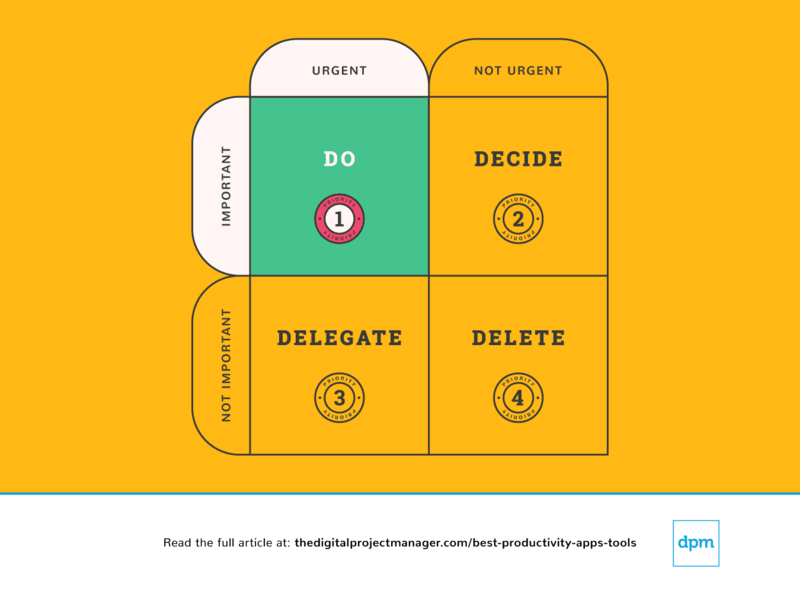 This tool is designed to help you delegate the more mundane actions of managing tasks so that you can focus on more important work! Zapier integrations include just about every app under the sun, because that’s what it’s designed to do (Google Drive, Gmail, Trello, Twitter, Slack, MailChimp, and hundreds more). Zapier costs from $20/month and is available on all operating systems. If you’re doing a lot of task management and delegation within a team, Slack is a best-in-class tool for team collaboration. Slack provides a platform for you to communicate with team members—this includes private chats and group channels, file sharing, tagging and mentions, and loads of integrations with productivity apps in order to sync up your work activities. You can use this tool to break out of endless email threads and enjoy a more transparent, easy-to-follow flow of communication and resources between you and your collaborators. Slack integrations include Teamline, Workstreams, ClickUp, Asana, Sentry, SimplePoll, Trello, and dozens of development, management, communication, finance, media, marketing, design, wellness, and other apps. Slack offers a free version with limited functioning, and if you want to upgrade, it costs $6.67/user/month. It is available on MacOS, Windows, Linux, iOS, Android, Windows Phone (beta). If you struggle to keep up with your social media plan, Missinglettr is a great tool for offloading and automating some of the work involved with maintaining your social media. Missinglettr scrapes your website for new content and automatically generates a social media campaign, which you can customize with text, images, and hashtags (similar to Buffer). You can choose from their premade drip campaigns (6-month, 12-month, blast, etc) and simply toggle on and off the social media platforms you’d like each post to be shared on. Missinglettr integrates with your blog and your social media accounts like Facebook, LinkedIn, and Twitter in order to automate your social media drip campaigns. Missinglettr has a free version if you have one site, and for more sites it costs from $15/month. It’s a SaaS solution, so it’s available anywhere on the web, but there’s no mobile app (yet?). Similar to Missinglettr, Buffer is designed to save time managing social media, letting you schedule posts, analyze and track their performance, and manage multiple social media accounts from within a single interface. For any business that struggles to keep up with social media or to maintain a consistent presence, you can build campaigns in advance and automate many of your social media activities with this tool. Buffer integrates well with Twitter, Facebook, Google+, LinkedIn, Pinterest and Instagram. Buffer offers a free plan for up to 3 social media accounts and 10 scheduled posts. Anything more than that costs from $15/month. It is available for iOS, Android, and as a Chrome extension. Another way to delegate some of your social media-related tasks is to employ other people to promote your content for you. QuuuPromote is an app for connecting with influencers who are paid to share your content (articles, videos, podcasts, infographics) across various social media platforms. When using this tool, you still have to do some of the grunt work to set up your campaigns. However, once you’ve set it up (your related links, relevant topics, etc), other people do the work of sharing out your content, hopefully reaching a wider audience than you could reach on your own. Upflow is designed to automate some of the work of keeping your social media accounts active. This tool help you curate content, putting your campaigns on autopilot, automatically add the right hashtags, and schedule social media content across all major platforms. The analytics features on this social media tool are fairly basic but provide useful charts for tracking engagement rate and seeing how your campaigns perform over time. Upflow integrations include social media platforms: Twitter, Facebook, LinkedIn, Pinterest, Tumblr, and its competitor social media scheduling app, Buffer. Upflow has a free Hobby version, and the paid plans cost from $29/month. Finally, we can sometimes be more effective by doing less. There are endless opportunities (and plenty of productivity apps to help you) to say “yes” to great ideas. At the same time, being able to carry them out requires you to say “no” to the right things. Learn to set boundaries and say no. It’s great to be nice and kind and help people out. The problem is, we don’t always have the time. That leaves us wide open opportunity to under-delivering or not delivering at all. You’re not going to do anyone any favours if you commit to something you can’t actually deliver your best work on. Just Say No is one of the more unconventional productivity apps—this tool is designed to help you “say no” to tasks or habits that you need a little help turning off. This app helps you set up goals for getting rid of pesky habits and set yourself up for success with inspirational quotes and images. It even allows you to set up shortcuts to reach out to friends who can keep you accountable to your goals. Whether it’s saying “no” to drinking, nail biting, or impulse buying, or working late, Just Say No provides a platform to track your progress and your money saved by breaking bad habits. Just Say No is free and is available on iOS. When you look at productivity software, it’s important to keep one thing top of mind: because productivity relies a lot on your attitudes and personal habits, the productivity tool itself is only so effective. User Experience: Is the interface simple and is the app’s system easy to learn? Do the features clutter the app, or are they useful? We only chose apps that are truly easy to use, without adding hassle! Organization and Prioritization: For to-do list apps, does the productivity app have a clear system for organizing and reorganizing tasks? For marking priorities and managing the most important tasks? Accessibility: It is available on multiple operating systems? There are several Mac productivity apps out there that aren’t available on Android, such as Omni Focus. However, we tried to stick with apps that are available across more devices. Reporting: What kinds of reporting features does it include? Can you track time spent on tasks, compare productivity over time, or use analytics to measure whether it’s actually working for you? Integrations: Does it integrate with some of the other best organization apps, best reminder apps, productivity tracker apps, etc? We look for apps that sync with other tools in order to automate as much of your task management as possible. Price: Does the price point make sense for the benefit that the app delivers? In most cases, you can use a freemium version for personal use, and paid plans tend to cost around a reasonable $6/month. What productivity apps do you use to stay organized and effective? Do you think these are useful, or do you prefer to use other prioritization methods? Share your thoughts on the types of tools we can be using to be truly productive. Really interesting take Ben! I agree productivity relies a lot on personal habits and attitudes. I have to admit I’m yet to discover some of the tools you have in the list.